He could have played in raucous arenas, in front of ravenous fans in the ACC, SEC, Big East, or Big 12, but he picked the little Catholic school in the Bronx with the even littler gym that can be as quiet as the university church. Severe's arrival was, and in some ways still is, expected to be the turning point. Landing such a highly-touted recruit, particularly one that can score in bunches, was coup for head coach Tom Pecora and his staff. "When you get Jon Severe to come to Fordham, job well-done. Check," Dayton head coach Archie Miller said in January. "He's going to be one of the premier freshmen in college basketball. I wouldn't be surprised if he doesn't lead all freshmen in scoring. I wouldn't be surprised if he doesn't lead our league in scoring." "He's as good a scorer as we've played all season," Harvard head coach Tommy Amaker said after Severe dropped 29 on the Crimson. "He's so explosive. You can see how streaky he can become. Once he sees the ball go in the basket one or two times, it's like an ocean out there for him. He's a scorer, in my opinion—not just a shooter. You can see him put it down and get to the rim." Rhode Island head coach Dan Hurley, who also pursued Severe and offered him a scholarship, called him a "very, very talented guy." "He's a great building block," Hurley continued. "The kid's gonna be a fantastic player." Severe's decision to come to Fordham certainly came as a surprise to some, given the wide range of options he had. Ultimately, the Brooklyn kid wanted to stay in the City. "I wanted to stay home, and I looked at the opportunity at a program I could turn around in my own backyard," he says. "New York is New York. I was born and raised in New York. I moved to Florida for three years and I wanted to come back home, so I thought of that." So he picked the program that has just one winning season since moving to the Atlantic 10 in 1995. To say Fordham is overmatched in the A-10 would be a gross understatement. The Rams are so thoroughly outclassed (132-296 all-time) in the conference that the mere prospect of respectability seems laughable. But Severe was sold the notion that he could change that. Could he? Early in his freshman season it seemed like he might. He scored 28 in his collegiate debut, a blowout over St. Francis (Pa.), and averaged 26 points while his team got out to a 4-2 start. But then came December 7, and a match-up at Madison Square Garden with St. John's. "[Severe is] a Big East-level player that we would have recruited in a normal year if we had scholarships available," the Johnnies' head coach Steve Lavin told the New York Post before the game. "Loved him, loved his game. [At] UCLA we would've recruited him, anywhere I've coached. He'll be a pro. He'll play in the NBA." High praise for a kid who had played six college games. Severe made his first shot, a three. And missed his next 20. He finished 1-21 from the floor in a 104-58 blowout loss. Severe says it was the low point of his season. "But I'm really happy it happened," he says. "I was way up there, but then I realized this is college, this is what happens … Now I can approach the game with the right state of mind. I have to think about my overall game." Any delusions that Severe's presence would immediately turn Fordham into a top-flight Atlantic 10 team were probably squashed right there. 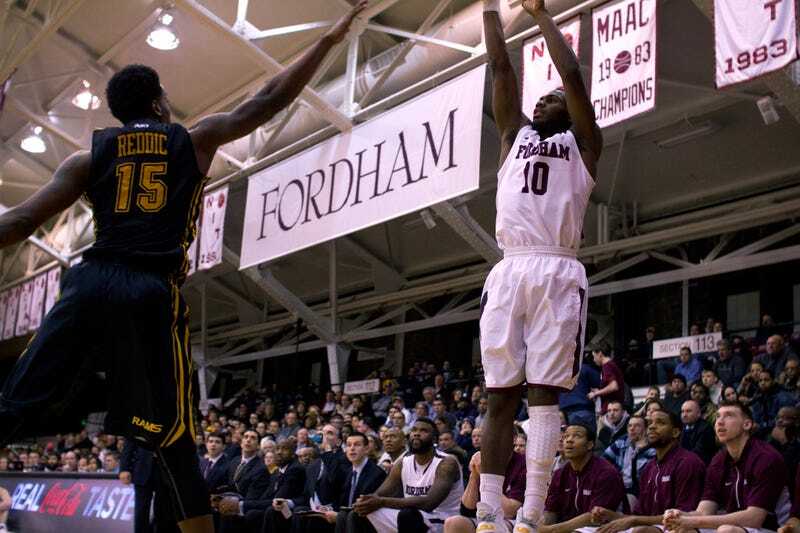 Fordham is still very much in a rebuilding phase, even as the program enters its fifth season under Tom Pecora. It's not as though trying to build a winner at Rose Hill is a Sisyphean effort. Fordham's sports history is rich. The school won't let you forget that Vince Lombardi is a Fordham alum, and that he blocked on the Rams' famed "Seven Blocks of Granite" line. The baseball team has won more games than any school in NCAA history. Even the men's basketball team, for all its recent struggles, was once quite formidable. PJ Carlesimo is a Fordham alum. So is Smush Parker. And Digger Phelps led the Rams to a 26-3 record and a Sweet 16 appearance in his only season as the team's head coach in 1970-71. Somewhere in the past decade, though, Fordham's athletic program reached its nadir. Between the women's basketball team's (im)perfect 0-29 season in 2007-08, the men's 2-26 record in 2009-10, and the football team's 1-10 debacle in 2011, Fordham's athletic department hit rock bottom. The football team has rebounded under a new coach, improving to 12-2 in only two seasons, and Stephanie Gaitley has turned the Lady Rams into A-10 champs. But rebuilding the men's basketball program has proved more difficult. In four seasons as head coach, Pecora has compiled an unremarkable 34-85 record, including a dismal mark of 9-55 in conference games. But it's not as though Pecora's Rams haven't had their moments. An early-season home win over a tournament-bound St. John's team in Pecora's first year seemed like a positive sign. The following season Fordham defeated No. 22 Harvard at home. Impressive victories, to be sure, but ultimately hollow ones. What appeared to be potential building blocks turned out to be mere blips on the radar. "It was a step in the right direction," says Nick Carroll, Fordham class of 2012 and a former sports editor for the school's newspaper who is now a staff writer for the Philadelphia Inquirer. "There was probably less of a, OK, they're hopeless and have no direction. But at the same time, they never really built off of that either. They still haven't done anything in the A-10, so it almost doesn't matter." Fordham took another step towards A-10 relevance in signing Eric Paschall, another highly-touted recruit who will enroll at Fordham this summer. Paschall, a 6-foot-7 forward who loves to post videos on his Instagram page of him throwing down acrobatic dunks, also passed up several big-time offers to come to the Bronx. The Dobbs Ferry native had scholarships on the table from VCU, West Virginia and Providence. "With him and Jon Severe, Fordham goes from the bottom of the Atlantic 10 to the middle and has a chance to do something," one anonymous college coach told the New York Post. "It's two good building blocks for them to have." Landing Severe and Paschall was certainly surprising, and left many people wondering why such talented players would choose to play for a long-struggling program. "What on earth is [Severe] doing playing at Fordham?" one person tweeted after Severe scored 22 of Fordham's 48 points in a loss to Saint Louis, the seventh-best defensive team in the country according to Ken Pomeroy. "This kid is the most impressive freshman in the country." "I like Fordham," Severe replied. "It's more then [sic] basketball." I asked Severe if he feels the need to defend his choice. "Not really," he says. "That was just a one-time thing. It won't happen again. I just thought it needed to be said… I'm never on Twitter. I just got a little eager. Like, Fordham's a good academic school." Fordham's academic reputation is its biggest asset in recruiting. Nearly every athlete I've interviewed in my four years at the student newspaper, across all sports, listed academics as one of the key factors in their decision to choose Fordham. "I knew it was going to be the biggest challenge in the recruiting area," Pecora told the New York Times. "I know it's something every other school uses against us. You have to find guys who can look beyond that." Fordham's facilities overall are lacking. The school simply doesn't have the funds to keep up with the more profitable athletic programs in the A-10. "Richmond's putting $18 million into their facility," Pecora told me. "UMass is a building a $28 million men's and women's basketball practice facility, with a weight room, with a dining area. They're doing things at the highest level. That's what VCU is doing. For us, when you're trying to build, and you're dealing with that kind of commitment as you move up the food chain, it's a great challenge." But for all the problems it presents when attracting talent, once the ball goes up Rose Hill might be Fordham's biggest advantage. On the rare occasion a game attracts a sellout crowd, the gym is as loud as any arena in the country. The exposed brick walls don't absorb any sound, and the rollaway seats quake when the fans stomp their feet, making the claustrophobic environment as harsh as any other. "I don't think I've ever been in a building that felt that loud," Carroll says, referring to the St. John's game in 2010. "[The Rams] were down like 20 in that game and came all the way back. That St. John's team was a good team, but they went to Rose Hill, Fordham went on a bit of a run, the crowd got loud, and they ended up sort of folding. That gym can be a real home court advantage, but you have to give the crowd something to cheer about." Severe is the kind of player that crowds get excited about. There were times during his first season when he was an absolute joy to watch. Like the first half of Fordham's January 22 win over George Mason; or, more accurately, the final 11:16 of the first half. Severe poured in 16 of Fordham's 23 points over that span, on 6-9 shooting (including 3-4 from deep), as Fordham cut a nine-point deficit to one. But after that game, Severe faded. At a certain point, the shots stopped falling; he looked less like a sniper and more like a loose cannon. Over his final 13 games, only once did he shoot better than 36 percent and he averaged only 12.2 points per game. Severe says he didn't have the proper conditioning to play at a high level over the course of a full college season. "It was a learning experience," he says. "Now I know what I need to work on, like taking stuff not seriously. In the weight room, conditioning, stuff like that — stuff I didn't think I needed to work on, but I do…I wasn't really prepared. I kept getting tired. I wasn't in the right shape. I lost weight fast." But he also says he saw his offensive struggles late in the year as an opportunity to improve the rest of his game. "In the beginning of the season I was thinking about scoring and scoring," he told me. "Towards the end of the season when I wasn't making shots, I thought about being a better overall player, [to] make the extra pass and play better defense." That's what he's working on improving this season. When I caught up with Severe, it was before one of the team's offseason workouts. With three players graduating and four transferring, next year's team will look quite different. Severe says he hopes the team will "play to win, not to lose," and that his goal is to "be more consistent." As the team's leading returning scorer, more pressure will fall on him to step up and be the guy that lifts Fordham from the A-10's cellar. And Severe knows what he signed up for. "I took the chance," he says. "I knew it wasn't going to be perfect, but I see that year by year it's going to be better." Top image courtesy of The Fordham Ram.